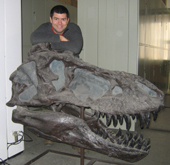 Dr David Hone is a vertebrate palaeontologist working in Beijing on dinosaur behaviour. He also runs several websites devoted to science education. Taxonomy is the field of research devoted to naming and describing living organisms - everything from bacteria and viruses to whales and flowers. It is an essential yet much underappreciated aspect of scientific research and without it huge branches of biology and other sciences would be near impossible. Taxonomists provide the basic vocabulary of biology if you like, defining each new species (individual words) and making sure there are accurate definitions of those species (like a dictionary) and records of those species, as DNA or actual specimens in museums so that everyone knows exactly which species is which and what other species it is related to. Without this kind of knowledge we cannot begin to do the simplest things with any degree of accuracy - if you do not know what species any given organism belongs to, then it becomes very hard to say anything meaningful about it. How do you protect a given species if you don’t even know what is, and what is not, a member of that species? Want to treat a snake bite? What species was it? Got a new drug from a rare frog, great! What frog was it? Are there any realtives that might yield similar compounds? Are you working on a single species of a bunch of them in your lab that are very hard to distinguish? A new insect is eating your crops? What is it? How can we kill it? Are there any close relatives we might kill by mistake that are actually beneficial? Want to track extinction rates over time? You will need to know what spceis can be identified in the fossil record. We can use some species as indicators of clean water, or to track global warming but only if we can reliably identify them and tell them apart from others. Taxonomy is therefore an integral part of biology and science as a whole, reaching out into other fields almost unnoticed, but most especially medicine. As a subject it is fundamental to our understanding of the natural world and critical to future research. We must know what speices we have and what they are to be able to continue to study everything from infectious diseases to pollution and the history of life. If we are going to save our planet, we have to know what is on there to start with. Pleasesir/Madam! I am teaching at some government universityu in Ethiopia. Since our university is new, almost all teaching materials are no accessible to me.Please, would you help me in some teaching materials on agricultural Seed technology,weed and theier management,Tlant taxonomy, vegetable production and management,tea,coffeeand spice cropsproduction andprocessing,Biometry e.t.c. Happy to hearing and see good response from you. Thanks! !it will help me alot Dr,,:)))GODBLESS US ALL! !